This lesson is based on a clip from the Gordon Ramsay TV show The F Word. About a year ago, Jamie Keddie of the excellent Lessonstream pointed me in the direction of this clip when he was writing for the TeachingEnglish website. As soon as I saw it, I knew I had to use it in class; it just seemed made for exploiting in the ELT classroom. Have a look and see if you agree. Since this programme was broadcast, Gordon Ramsay has updated the Beef Wellington recipe for Christmas. For homework, ask students to watch and note down the differences between the original and the Christmas version, and make one of them themselves. And that’s all from us for 2011. Enjoy the holidays and check back in the new year for the next update. What can we say?! 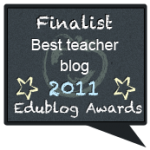 We’re amazed and delighted with our second-place finish in this year’s Edublog Awards in the category of Best Teacher Blog. We’d like to take this opportunity to say thank you to everyone who voted for us. We really appreciate your interest and your support and hope you’ll continue to visit us in the future. 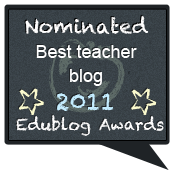 Select best teacher blog from the category drop down menu, then select allatc from the menu below and press vote. I came across this and was spellbound by the beautiful music, the wonderful little boy and the unexpected ending. It also fit the bill perfectly for a jigsaw-style video activity I’ve been wanting to try for a while now. It’s taken a good hour-and-a-half with every class we’ve tried it out on but they’ve all said the time flew. And they were desperate to see the ending! Try it out and see what you think, but first, watch it yourself!